These are from Vegan with a Vengance. I knew they would be good because they have almond extract in them. I substituted 1/2 cup of apple sauce for the 6 oz soy yogurt. I'm glad to know this substitution works, because she asks for those 6 oz. soy yogurts quite a bit! I also substituted fresh cherries for cherries that were already pitted and canned in a glass jar. This worked out fantastic, plus I didn't have to pit any cherries. The almonds on top were a nice touch. They tasted so good because they were toasted. Those are SO cute! I have never baked with almond extract (just vanilla), but I notice a lot of Isa's recipes call for it. I've gotta pick some up. Is that a silicon muffin tray? Do you love it? Does the batter ever stick? Megan! You have to get almond extract. It makes the ordinary, extraordinary! It is well worth the small price tag. Yes, that is a silicone muffin tray. I do love it. 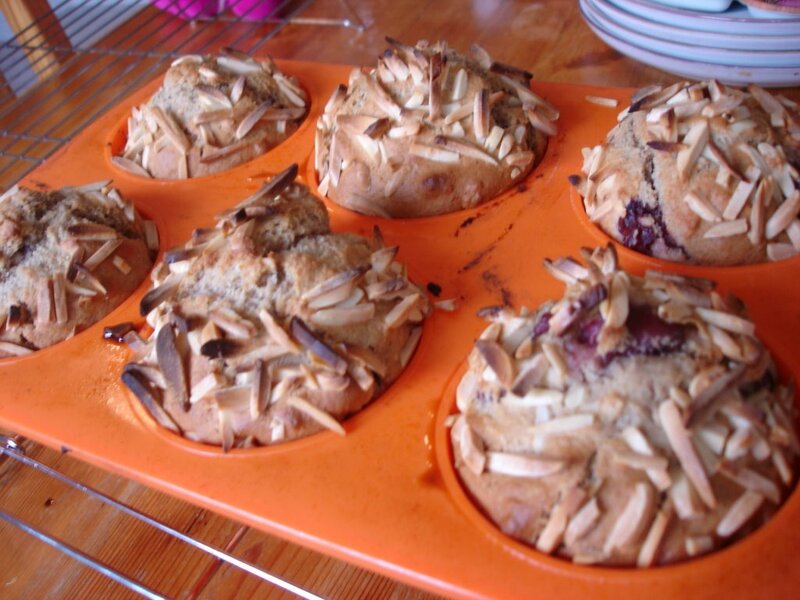 The batter does not stick, the muffins pop out (without the use of paper cups) and they are a breeze to clean up. Also, they store really easily because you can roll them up and squish them wherever they will fit. I would love to get a small muffin tin to make mini-cupcakes for my daughter. I wonder if there are any health precautions that we should be aware of? Are there any things we should be aware of when cooking with silicone that might inhibit optimal health? Does anybody have any of those silicone oven mits? My husband thinks they are cool. I also think they would hold up a lot better than the quilted material ones - also I often burn myself with those!